The planet with the most eccentric orbit in the Solar System is Mercury. The eccentricity for the planet is 0.21 and its distance from the sun ranges from 46-70 million kilometers. It only takes 88 days for Mercury to orbit around the Sun at 47.8 km/sec (29.7 miles/sec). A typical year on Mercury would take 88 Earth days. Because of Mercury’s ever changing distance from the sun and its 3:2 spin-orbit resonance the temperature on Mercury’s surface is complex and varied. A day in Mercury is twice as long as a year in Mercury. One solar day lasts 176 earth days, which is almost twice its orbital period, which means that one year is half a day. The axial tilt of Mercury is 0.027 degrees. This is the smallest axial tilt in the solar system with Jupiter coming in at second. In some parts of the surface of Mercury, the sun rises halfway then sets again and then rises again. This happens is equivalent to one day in Mercury. 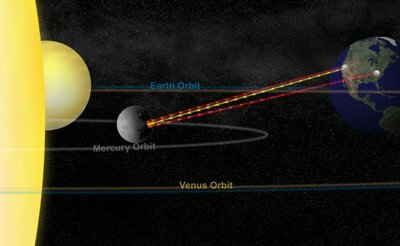 The reason for this is that four days before perihelion, the angular orbital velocity of Mercury is equivalent to its angular rotational velocity. The apparent motion of the sun stops. When perihelion occurs the rotational velocity is less than its angular orbital velocity. After four days, the sun’s apparent motion will return back to normal. It was once believed that only one side of Mercury faced the sun. It wasn’t until 1965 that it was discovered that the planet has a 3:2 spin-orbit resonance. It rotates three times every two revolutions; a day on Mercury is equivalent to 58.66 (88×2/3) Earth days. The reason why they thought that only one side of Mercury faced the Sun was a mere coincidence as every time Mercury was observed, the same side is seen by astronomers. how do mercury’s periods of rotation & revolution compare to earths? This is a good website for peolpe to learn about space and the solarsystem. The eccentricity is a ratio between it’s farthest and closest points, the bigger the orbit, the bigger the difference that same ratio represents. Comparing the eccentricity of Pluto’s orbit to the eccentricity of Mercury’s orbit only compares the shape of the orbit. Pluto’s orbit is slimmer than Mercury’s. Every planet in the solar system accelerates as it gets closer to the sun, that is why the orbit is an ellipse. If the orbit eccentricity of is 0.21 that it’s .04 away from pluto’s orbit eccentricity which has the most eccentric orbit in the solar system so that’s really why mercury moves farther and closer away from the sun because the sun isn’t at the center of any elliptical orbit so when it gets closer to it, it would move much faster. i dont get this whats the difference between mercuries orbit rotation and revolution?